From A Passive Solar Modern Prefab House To A 150+ Year Old Ramshackle, And Back. We traveled from the passive solar modern prefab house on the land, to the 150+ year old Ramshackle on the bay, and back. The summer of back and forth has begun. The drive down was adventuresome. Yet somehow we managed to move twelve chickens, two children, three mastiffs, and A HORSE to the old Ramshackle on the bay. Now we go forth and back, and back and forth, with just the dogs and children. We sail, then sail off grid in our modern prefab house, to... and fro. "Oh great she's got that vacuum cleaner out." From top to bottom, I am scrubbing! The first days on the bay are not fun. The Old Ramshackle needs to be deeply scrubbed and dusted and fogged for any mold- we are an extremely allergic family, and even though "normal" guests can't smell a thing (which is good news! ), we need to make sure any mold spore is gone. Thankfully, the energy efficient improvements we made on The Ramshackle last summer have helped immensely, especially the convection wall heaters! Also: I would like to deeply thank my friends who told me I was not crazy about dragging our horse to the bay and helped me to make Camp Cornbread happen when it was clear Pip 2 could not be on the sailing team this year due to her medical issues. When her anxiety starts rising, we head out to brush him. As she lunges Cornbread, she gets her own head back on. Panic attacks wane as she works on her project horse. She leaves her horse happy and my little girl again. When she's feeling well, she even has her first job as an exercise rider for another horse! She is thrilled. We all know this family is about reuse. Heck I even caught Pip 1 walking around with a found trash bag as a belt this week, OH YES I DID. "Where'd you get that belt, kid? Wait. WHAT is that belt???" Whether in the city, on the land, or sailing the bay, I also enjoy repurposing and reuse by thrift shopping. 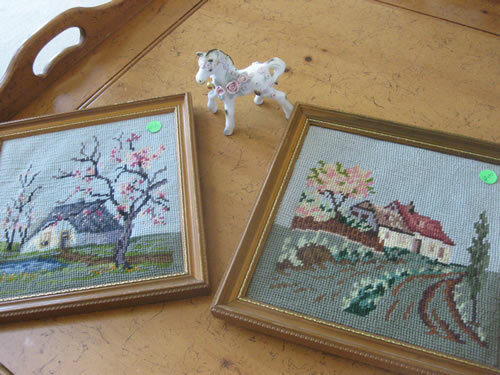 I have a soft spot for thrown away hand-made items that later generations dismiss, especially cross-stitch. Anytime I see a cross-stitch tossed into a thrift store, I usually buy it. I picture a long-ago woman lovingly creating it and say, "Oh you poor dear, you can come home with us, I"ll give you a nice place on the wall somewhere!" I don't even like cross-stitch. But by golly, it has a home, even in our modern house. "Hmmmmmmm THESE LOOK LIKE OLD LADY PLATES. I'll take them home, the poor dears! I can serve Old Lady Food on them! Avocados with dressing, cold meat salads, aspic, chilled chicken with iceberg lettuce wedges and blue cheese dressing... these'll be my Lady Lunch Plates, how fun!" I thought of a careful, feminine woman long ago, whose ungrateful "These Don't Look Like West Elm" grandchildren were cleaning out her storage and tossing them away. Even the thrift store didn't like them, they were 50¢ apiece! So I threw 'em in my basket and dragged them home, muttering as I always do when I pick up (more) china and cross-stitch: "Handsome Husband's gonna kill me..."
As I washed the grime off, they began to sparkle. "What's your story?" I wondered. So I looked up the mark on the internet, and lo and behold those dinky plates are A HUNDRED AND FIFTY YEARS OLD from ENGLAND. That tacky metal was GOLD. Imagine their stories! I hope to enjoy many more stories with them. Hey, Did Y'all Hear? The President Called The Mayor of Nearby Tangier Island! "Most of low-lying Tangier, with a population of about 450, is listed on the National Register of Historic Places. Because of the isolation, many residents have retained the linguistic traces of the island’s primarily English settlers who first arrived in the 17th century. The island is also sinking from erosion and rising sea levels, and scientists predict that residents may have to abandon it within 25 to 50 years. View from the kitchen area towards east. "Oh let's develop this watery area, we'll make money..." they said.